An original posting that grew in the past week from 4,185 words and 53 references to 4,697 words and 82 references, has been cut to 3,208 words and 63 references. This writer, while demanding that WP take down a cartoon of me torching PRS at the stake (a violation of WP’s alleged neutrality) has been sending numerous documents and links to WP in an effort to flesh out a very sketchy portrait of the Society. While the cartoon of me burning PRS at the stake (http://tinyurl.com/cv62e39) has been removed, the section on me headlined “Controversy,” has been cut from an original 695 words to 312. The WP editorial tack that somehow there is a “controversy” over what we report about PRS and that we are being “contentious,” is about as mistaken as anything can be. The O’Dwyer Co. reports facts about the Society that cannot be challenged. Many of them are negative but that is not our fault. One may as well blame fires on the firefighters who arrive to put them out. Everyone criticized PRS for interfering with competition. Dragging me in as a critic is both gratuitous and unfair. The only thing that should have been reported here is that the FTC forced PRS to sign a consent decree. Dragging me into this as some carping critic serves no purpose except to impugn this writer’s motives. The author of the history, an anonymous WP editor called “Corporate Minion,” shows little knowledge of many of the key events in PRS’s history such as the consent decree (I told CM about that) and its nearly 40-year dominance by a small clique of “accredited” members. A chronological approach is used (“PRS is a nonprofit trade association based in New York city…founded in 1947”) when what is needed is a concise, punchy description of its current situation. This should be the topic sentence: PRS, as it closes its 65th year, finds its growth has stagnated (19,600 to 21,600 members in 14 years), its small clique of “accredited” leaders and staff have grown ever more reclusive, it is wracked with information-blocking and undemocratic practices, and it is under censure by the National Press Club, New York State Senator Liz Krueger, PR Watch and numerous individuals for interference with press coverage. The WP entry fails to say that only those from the 18% of members who are APR have been able to run for office since the mid-1970s. Last year’s chair, Rosanna Fiske, spoke to only two of the 110 chapter memberships and there is no evidence that this year’s chair, Gerry Corbett, spoke to any of them. No chair has addressed the New York chapter in more than 20 years. Bill Murray, president and COO, has not addressed any New York group in six years to our knowledge and definitely not the New York chapter membership. Transcripts of the Assembly vanished as of 2005. Rank-and-file members don’t know who is in the Assembly, what they say, or how they vote. 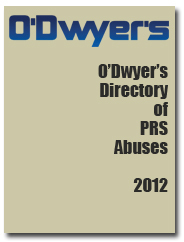 This website has compiled an ever-expanding O’Dwyer’s Directory of PRS Abuses (http://tinyurl.com/9uvowzp). These are not criticisms of PRS but descriptions of abusive practices such as failure to book dues over the course of a year (http://tinyurl.com/9jmxah8), moving h.q. downtown for 15 years and killing the printed members’ directory with no input from the Assembly, and removing the single list of chapter presidents from the PRS website. PRS’s combative measures when confronted with competition or criticism must be highlighted in any history. D.C. counselor Summer Harrison, having read in 1988 in major media about four PR executives meeting with CIA head Bill Casey to plot ways to win public support for the Contras in Nicaragua, publicly demanded in that PRS censure them (1972 president Kal Druck, Bill Greener, PRS treasurer Ken Clark and Burson-Marsteller’s Jim Bowling). Supporting the Contras was against the law and the CIA is not supposed to operate in the U.S. The House Foreign Affairs Committee in 1988 charged the CIA with illegal activities aimed at manipulating the press. PRS’s Ethics board, headed by Elias Buchwald of B-M, asked Harrison to assemble details of her charge although they were already in print in numerous places. This put Harrison in the position of being the investigator, rather than the EB. Harrison sent her assembled facts to the press as well as the EB. She also demanded that Buchwald remove himself from the case since a co-worker was involved. Buchwald continued to send questions to Harrison. She soon decided they were after her, not the four execs. She was right. The EB exonerated the four execs and censured her twice, saying she publicly discussed the case. She did, but that was before she contacted the EB. PRS decided to fight 12 authors in court when they discovered in 1994 PRS’s 18-year practice of selling copies of their articles, including entire chapters of books, in information packets. Packet volume had grown to 3,800 packets yearly by the 1990s, netting about $60,000 according to PRS’s records. PRS didn’t talk to the authors nor make any effort at amends such as making a monetary settlement, giving them free ads, letting them exhibit at annual conferences, etc. Lawyers told the authors that fighting PRS in court would cost hundreds of thousands. Truculent PRS was combat-ready when a group of 40+ exhibitors formed the PR Service Council in the late 1980s and pressed for better treatment at national conferences. The PRSC also started to have monthly lunches that featured leading PR figures such as Kirk Stewart, CEO of Manning, Selvage & Lee, and Betsy Kovacs, COO of PRS. It was working on a code of ethics for video news release producers. PRSC was starting to rival PRS’s New York chapter, which had abandoned such lunches, as a force in the New York PR community. This did not sit well with PRS so in 1995 Gaulke spoke to the PRSC and told them the exhibit hall was being closed. The exhibitors went ballistic but were powerless to do anything. PRSC soon disbanded. It was not until 1999 that the exhibit hall was opened again. Members of the PRSC did not organize again. They had learned their lesson. Claiming the e-mail defamed her, Bolton and PRS leaders started a legal action via Moses & Singer to reveal the identity of the e-mailer with the intention of filing a defamation lawsuit. The only problem with that was the e-mailer came from a family of means which hired the law firm of Quarto Dunning. It filed a 13-page reply to New York Supreme Court. QD argued that the complaining letter had only been sent to the board and PRS should have had a device that allowed criticism of organizational policies on an anonymous, protected basis to the board. All filings were public record and a lengthy story resulted in the New York Law Journal that was an embarrassment to PRS and Bolton. 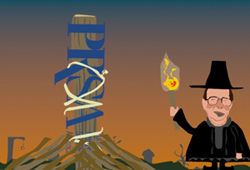 PRS won the right to “out” the e-mailer but never publicized the name nor did it launch a defamation suit in behalf of Bolton. PRS legal costs were estimated at $50,000+. M&S asked QD to reimburse it for such costs but was, of course, refused. PRS had bared its usual legal fangs but to no avail this time. PRS, straying far beyond its New York State charter that calls for it to be a resource for the entire PR field including non-members and avoid competing with any tax-paying business, in 1998 sent a letter to advertisers urging them to advertise in PR Week/U.S. which was starting up in November. Gaulke said he and 1995 PRS president John Beardsley had gone twice to London to convince Haymarket to launch a U.S. version of PR Week. The e-mail to advertisers said “We could introduce them to leaders in the business, help them meet our advertisers, we could encourage our members to subscribe and we could launch some new products down the road.” PRW/US’s initial circulation came from PRS mailing lists. PRW/US, in its promotional efforts, started offering its $249 Contact directory as a premium for subscribers to $198 PRW. This was in violation of USPS rules which say a premium can be no more than 70% of the cover price of a publication (http://tinyurl.com/c8zqhbh). The O’Dwyer Co. gave USPS copies of PRW/US promotions and PRW/US was forced to take the cover price off the directory although it continues to offer it as a premium. PRW/US was audited by USPS and switched to monthly publication in June 2009. Barring O’Dwyer reporters from the 2011-2012 Assemblies and national is but the latest in a long history of harsh, legal-based policies and practices of the Society. They are out of keeping with the charter of PRS which is to be a shepherd for the entire PR flock and be a peacemaker, not a war maker.